A couple of weeks ago an article I wrote with Professor Andrew May on urban regulation and specifically the lockout laws appeared in The Conversation. It provoked a strong reaction across social media and also in private correspondence. Our critics accused us of being libertarians due to our questioning of regulation and indifferent to the public health of the community. Others have appreciated the historical perspective that we offered. We treated the lockout laws as a lens through which to consider some of the nuances of how regulation actually operates in cities, suggesting that it invariably impacts urban life—whether for better or worse. In ninteenth-century Australia, some people sought to impose stronger liquor regulations in our cities on the basis of their moral or religious convictions. Temperance campaigners and other regulationists perceived the consumption of alcohol as sinful and degenerate. Alcohol consumption was said to lead to the degradation of society, particularly when it was working class people, or women drinking. The strongest of the criticism was reserved for those drinking in public, at public houses and bars. If a person had a drawing room where they might drink in private, these issues were less pronounced, and any changes to liquor regulations would have had less of an impact on them. So though this regulation was targeting a particular issue, the impacts were felt in the streets and public spaces, where ordinary people went. In Australia, our relationship to our cities has changed over time. Prior to the clearances of the so-called slums from the 1930s onwards, the population density in our inner-cities was very high. Homes were cramped. Before we were lured to the suburbs with large private homes, white picket fences and suburban bliss, the dominant place for recreation and leisure was therefore the city itself. So when those campaigners sought to eliminate alcohol consumption, they had to provide alternative places in the city for people to spend their time. Across Australia, immaculate buildings were built. I’m thinking of the Federal Coffee Palace in Melbourne, the Sydney Coffee Palace in Woolloomooloo, the People’s Palace in Brisbane and many others. In Australia our relationship to our cities is changing again. While our suburbs are growing, so are the numbers of people living in our inner cities. With increased density, there are more people around on the streets, seeking places to go for a coffee or a drink, for a movie or a walk. Think of the rejuvenation of many shopping strips where apartments are being built, serving the increasing numbers of residents. 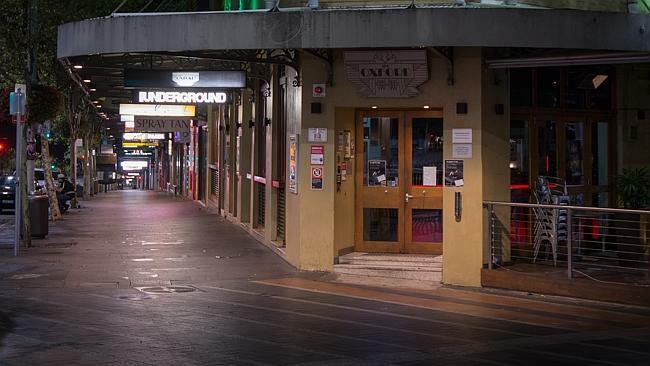 Today, when increased restrictions are introduced for bars and clubs, via say the lockout laws or noise curbing efforts for music venues, those alternative places, like the coffee palaces, rarely exist. This literally locks out the city for particular groups of people. And what happens then is that streets are becoming quieter, people have fewer places to spend their evenings. The city in a sense becomes less safe or at least feels less alive—for some groups in the community. This may have less of an impact on say families or older people who may be less interested in late nights out, but for younger people, millennials particularly, this is a real issue. The street and the city are places where people might discover who they are. For example, King’s Cross, Sydney and South Yarra, Melbourne have been liberatory places for LGBTQ communities for many decades. 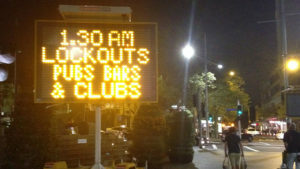 Or what about people that are knocking off from work at midnight and don’t want to head straight home on a Saturday night? Ultimately: Are the lockout law really the best policy prescription to what is an extremely complex urban issue? If the past tells us anything, it’s that there is rarely a right answer, just many possibilities. And that there will inevitably be unintended consequences for the life, safety and diversity of our cities. I do not have a view on what the right or best policy prescription is. And (of course) violence in all its forms must be condemned. However, we must also be asking ourselves at moments like this what sort of city we want, and to make sure our cities offer something for everybody. That’s a basic right. Might you speak a bit about ‘sly grog’ as a way of responding to those prohibitions? Great example—and the production of sly grog was a very direct response to forms of alcohol temperance and prohibition. And had a series of health and welfare issues associated. Making consumption of particular things restricted or illegal will never totally eradicate the (apparent) problem. The limits of regulation.